On Monday night, the fiance and I planned a simple dinner for Valentine’s Day since we celebrated ahead during our fun weekend in San Diego for Valentine’s weekend. We had a simple salad, whole roasted chicken and dessert on the menu. We both worked on Monday, came home late and started eating around 8pm. I must have been in a rush preparing the salad because I didn’t do a good job washing the lettuce. Chris found bugs in his salad that I prepared for him. I’m thinking it came from the lettuce bunch that I washed and chopped myself 😦 He lost his appetite right after he picked the bugs from his mouth (yeah I know…eeew). The good news is that he already ate his chicken and tortillas before he ate the bugs, so he had a hearty dinner in his stomach before he called it quits on dinner. As for me, since I didn’t see bugs in my food, I continued eating what was on my plate. We laughed and it made for a memorable night. Instead of showing you the bug-filled food, I’ll just show you the delicious Sushi dinner we had on Saturday night in San Diego. Every time we go to a Sushi restaurant, I always want to order Seaweed Salad. This serving was tasty, not too sweet, not too salty and just the right amount of vinegar. I don’t eat raw fish, I have tried many times in the past to eat it, and there’s just something about the texture of raw fish that I don’t like. Chris is a sashimi lover so raw fish is always present in the house. 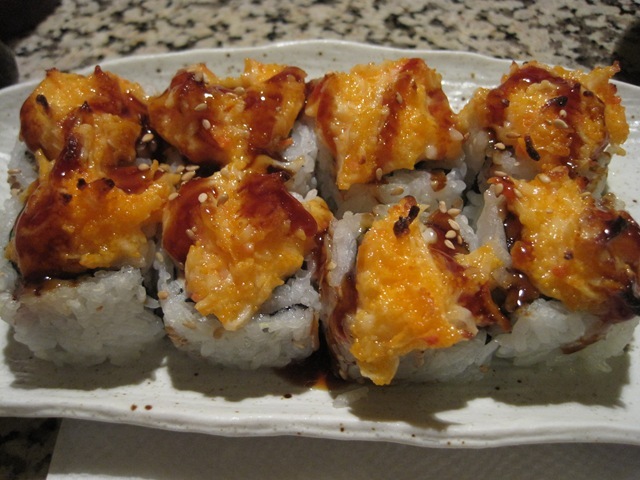 Baked Salmon sushi rolls was the highlight of our dinner for me. 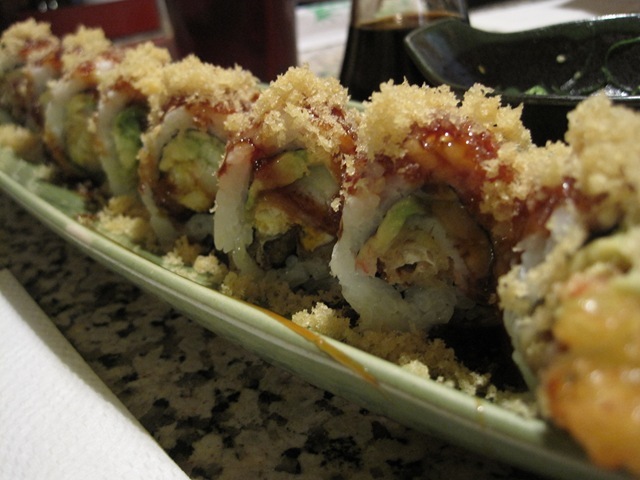 We shared the Spider Roll and California roll too. Chris ordered a few extra rolls that escaped the camera. I made these bars for my sister’s baby shower last week and also for Valentine’s Day. These bars have a few layers in them so there is a good mix of flavors all in one bite. The coconut and chocolate are the strongest flavors. ***Important note: These bars require several hours of chilling (overnight is best) to firm them up before slicing, so plan accordingly. 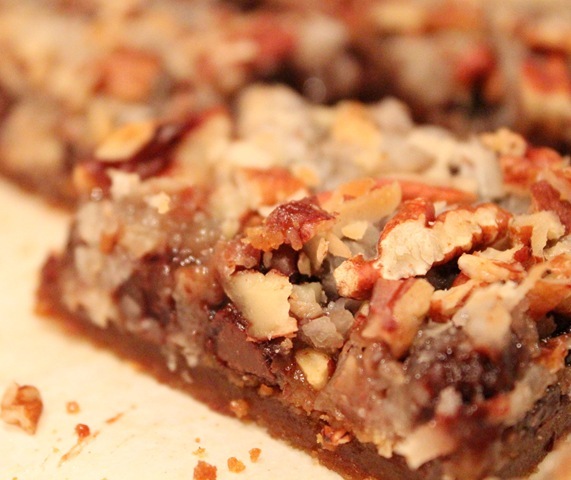 I adapted my version of these magical bars from the recipe on Post Punk Kitchen. 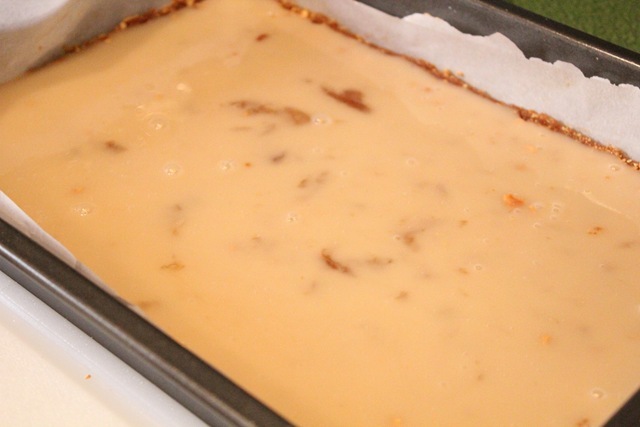 In a large saucepan whisk together coconut milk and brown sugar over medium high heat. Bring to a boil, reduce heat to low and simmer for 10 minutes, stirring occasionally. 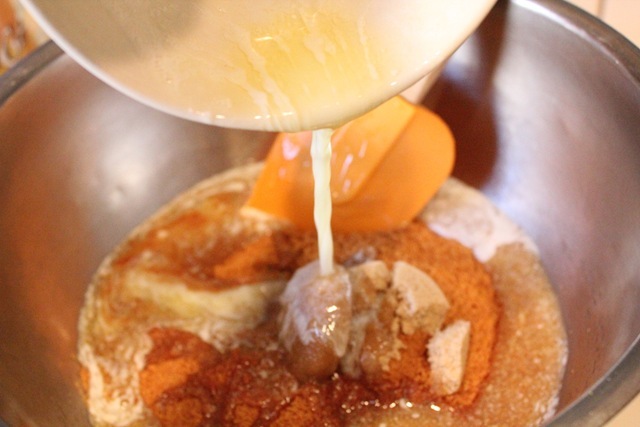 Mixture may form a thin skin on the surface; just stir it back into the liquid. Remove from heat and let cool while preparing the crust. 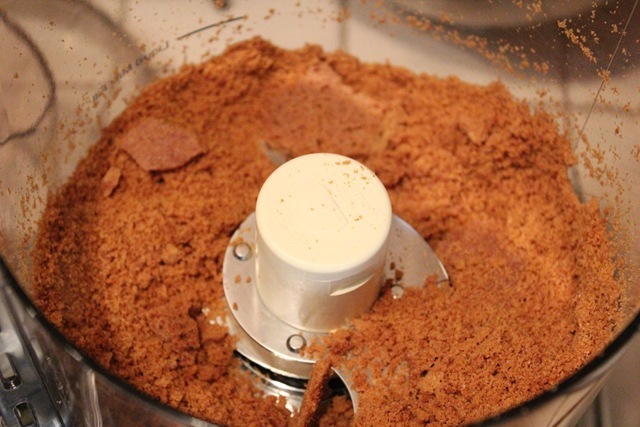 Since I used whole cinnamon graham crackers, I put the crackers in the food processor to make crumbs. I left a few chunks in the mix. 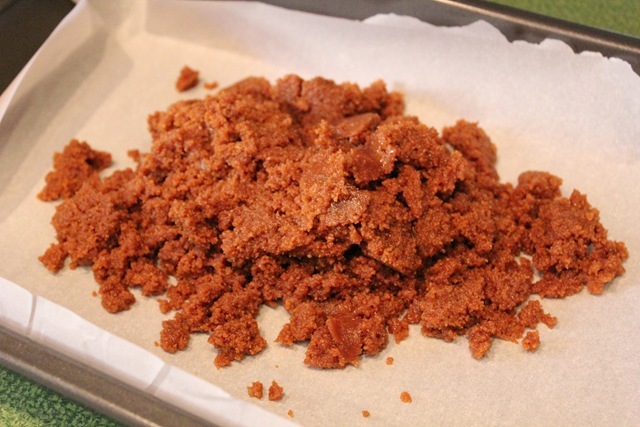 In a large bowl combine graham cracker crumbs, melted butter and sugar; mix well to moisten crumbs completely. Firmly press mixture into prepared pan, pressing evenly from center to sides of pan. Pour warm coconut milk mixture evenly over crumb base. 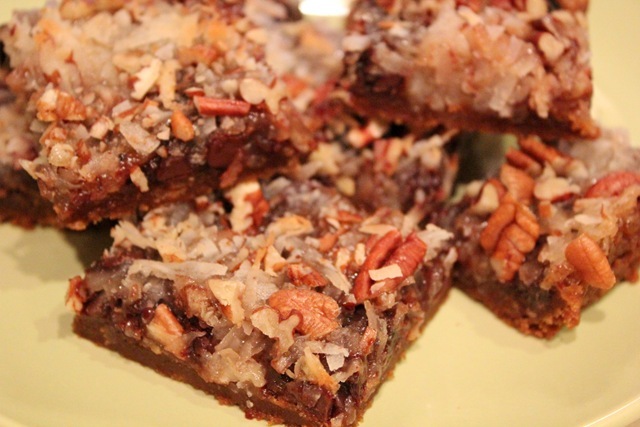 Top with an even layer of chocolate chips, flaked coconut and nuts, in that order. Firmly pat everything down until coconut milk mixture soaks upward into the toppings. 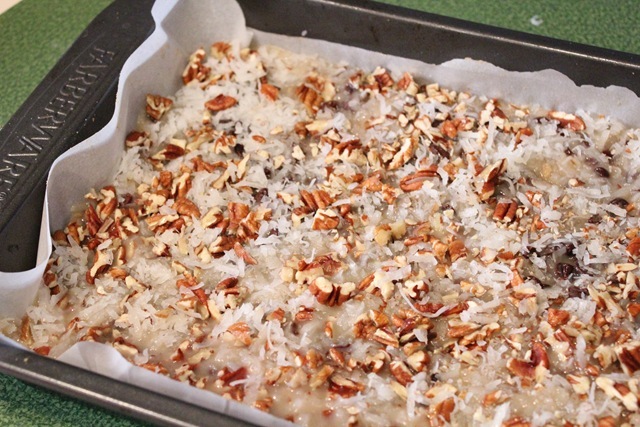 Bake for 28-30 minutes or until coconut is deeply golden and filling is bubbling, remove from oven and let entire pan cool on a wire rack for 15 minutes. 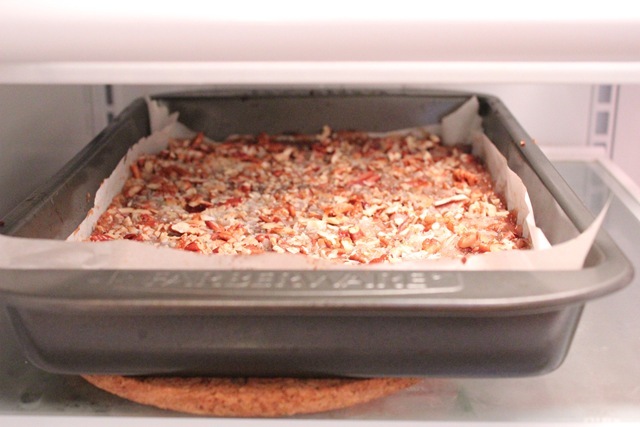 Transfer pan to the refrigerator to completely cool and firm up for at least 4 hours, even better overnight or until very firm. Use a sharp, heavy knife to run along the edges of bars, slide bars on parchment paper out of pan onto a cutting board then to slice into 24 squares. Store in a covered container in the refrigerator. 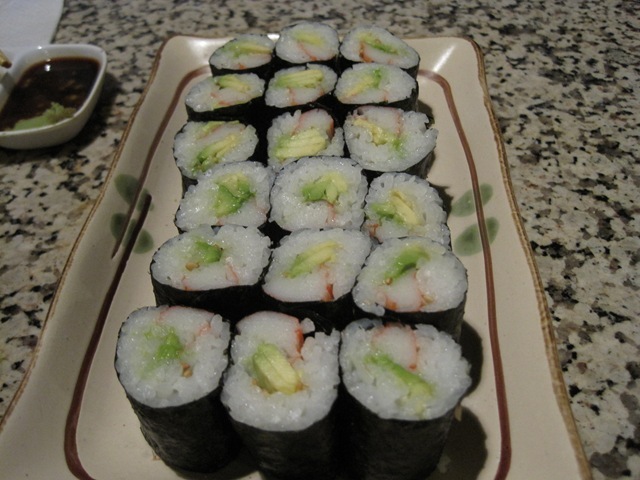 These also freeze well, tightly wrapped and allowed to thaw for 20 minutes before serving. Cute bite size bars (baby shower party plate). 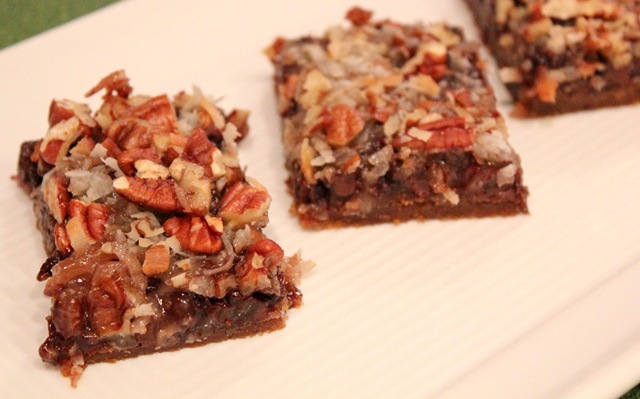 I cut the sugar from the original recipe and I’m even tempted to use less sugar next time I make it and also use an oatmeal based crust 🙂 The chocolate and shredded coconut provides enough sweet for me. I think the fiance might have a salad phobia now, lol! Well, at least salad prepared by me. I’m glad you enjoyed your time. It made for a fun night because we just laughed. 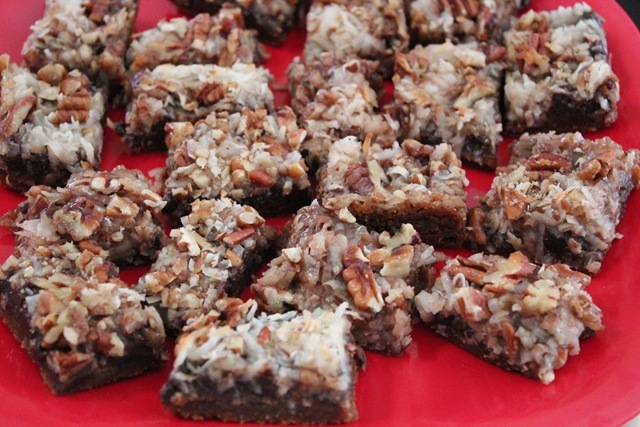 Any of the “magic” cookie bars get my heart all a flutter… they’re one of my favorite things to make! How did I know that already? I saw you bake a storm during the holiday season. Did you save and freeze some for rainy days? or is it all gone? I have these bars wrapped individually and keeping them frozen so I can have one everyday if I want to for a month, lol! 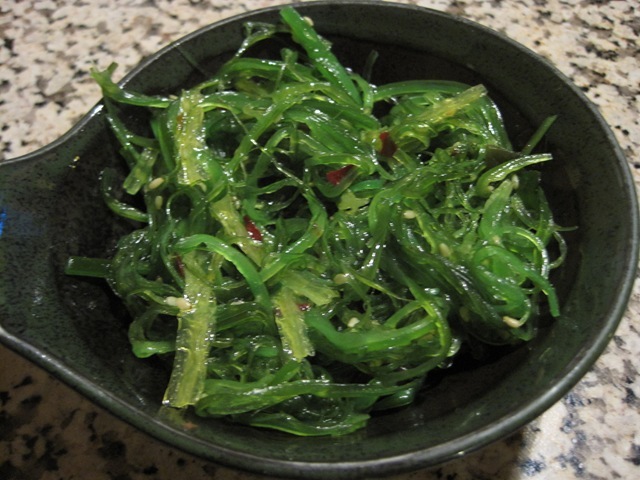 I love that seaweed salad. As a friend of mine once informed me, she could eat an entire mixing bowl of that seaweed. 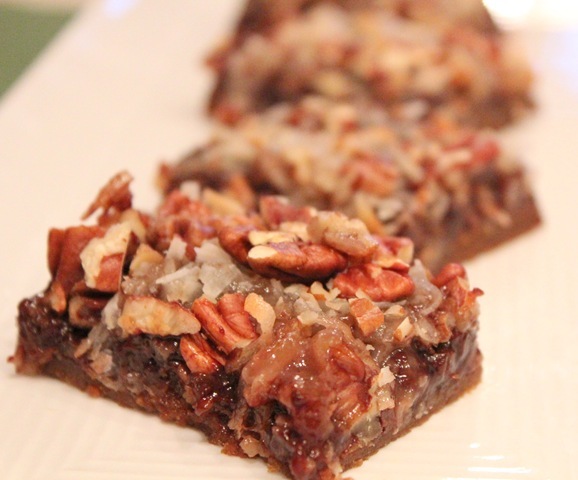 Those bars look like little pecan pie bites. So sad to hear about the buggy salad. I once purchased a bunch of kale from the Farmers Market and when I washed them , I noticed a million bugs in the water. Even after washing it 3 times, there were still millions of bugs. I almost threw up. I can’t believe the bugs!!! Eek! Actually, I can, but I can’t believe it has never happened to me! Really excited to meet you next month – I’ll email you! The bars look ridiculously good and not too sugary. Yum! Last week I tried to make kale chips and the kale was covered in bugs. I freaked out and had to throw it all away and scrub my kitchen- sometimes I spaz out like that. Thanks Hollie, you can even make them with less sugar if you want. The chocolate and sweetend coconut provides enough sweetener. I just had one tonight, one of the bite size bars straight from the freezer and I was thinking that I can get away with less sugar next time. Those salmon sushi rolls look amazing! 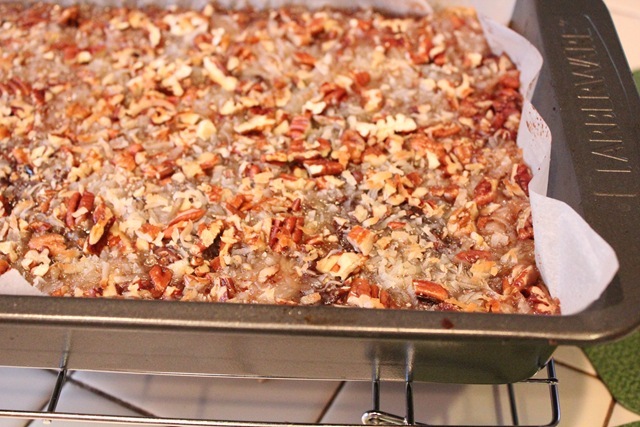 And I LOVE that you posted this recipe – WOW – everything about it looks and sounds awesome. wow, those bars look amazing! I have been on such a coconut kick here lately putting it in everything! I even sprinkled it on my salad last night LOL. 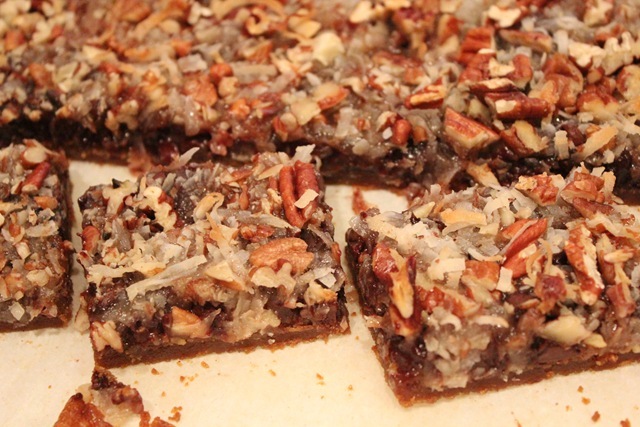 And your coconut bars do look magical! What if these bars are served by Zach Efron…then you’ll come to Cali? lol! Those bars look so incredible! I definitely need to try making them. So yummy! 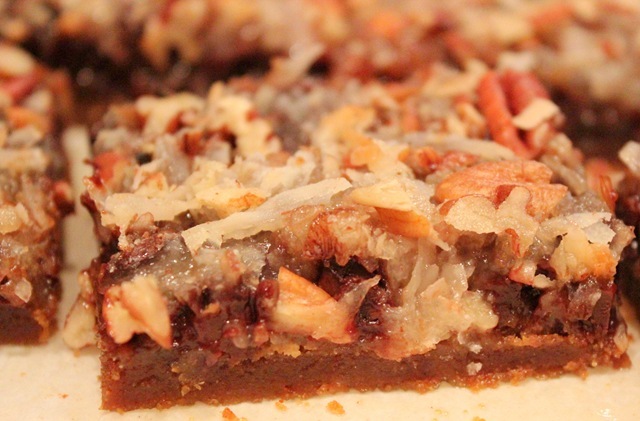 So gooey and rich and sweet. 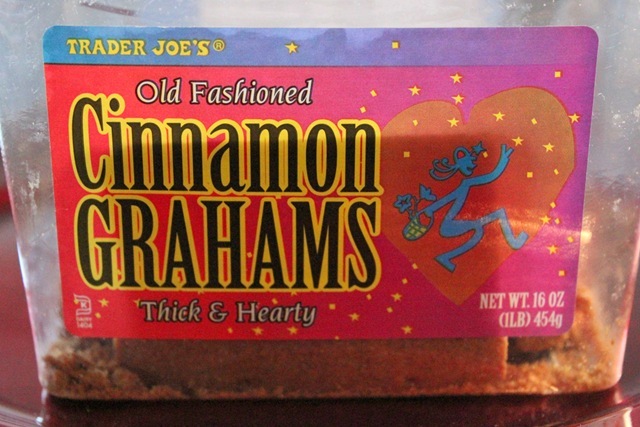 I absolutely want some right now (for breakfast…ha!) I’m sure they’d be delectable anytime of day. I should use more coconut. Thanks for the post and recipe!